A single coat of spray-applied liquid waterproofing membrane will overcoat and completely re-waterproof just about any failed and leaking roof. 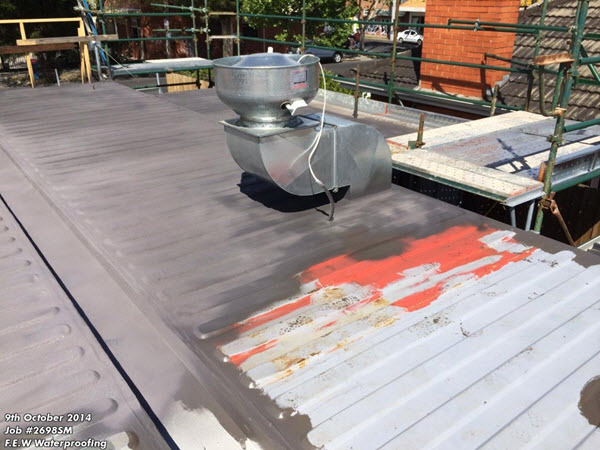 This concrete roof required extensive waterproof repairs, sealing & remediation works. 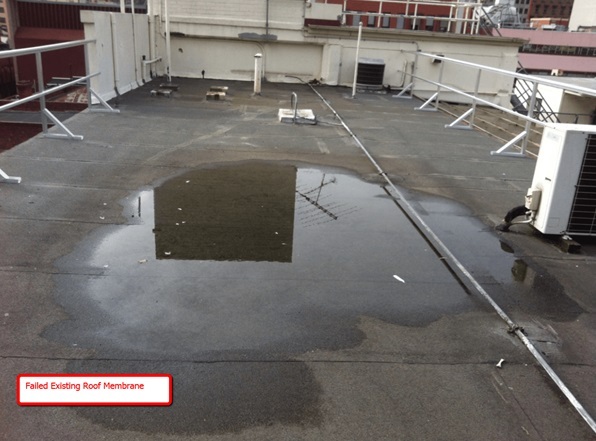 The water leaks originated from the deteriorated rooftop deck and was causing extensive damage to rooms below. This needed to be resolved immediately due to the constant on-going water leaks. The challenge was a roof deck that was very "busy" with rooftop services. There were numerous utilities and HAVC units located of the roof surface - these all needed to be sealed & waterproofed. 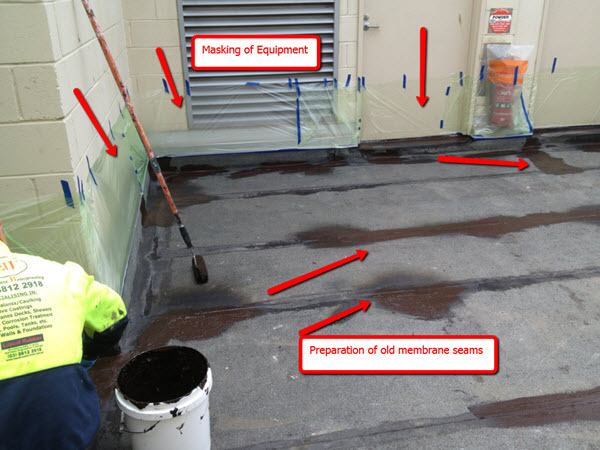 Spray-applied Liquid Membranes will provide a long term waterproofing solution for all types of leaking roofs. Liquid Membranes are an ideal waterproof coating for flat roofs - these roof membranes can withstand "ponding" water which is critical with minimal falls. This was a small roof repair job in as far as total roof surface area is concerned however it was challenging job that required extensive and detailed preparation. Detailed and time consuming roof preparation was critical to provide a clean base to ensure a permanent & long life roof membrane coating. 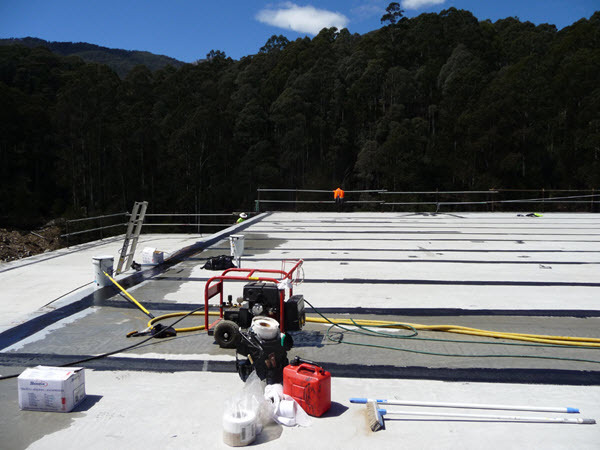 Liquid Roof Waterproofing is spray applied in one pass creating a seamless & flexible roof coating. Liquid Membranes will completely encapsulate & overcoat the existing failed and deteriorated sheet and torch-on waterproofing. 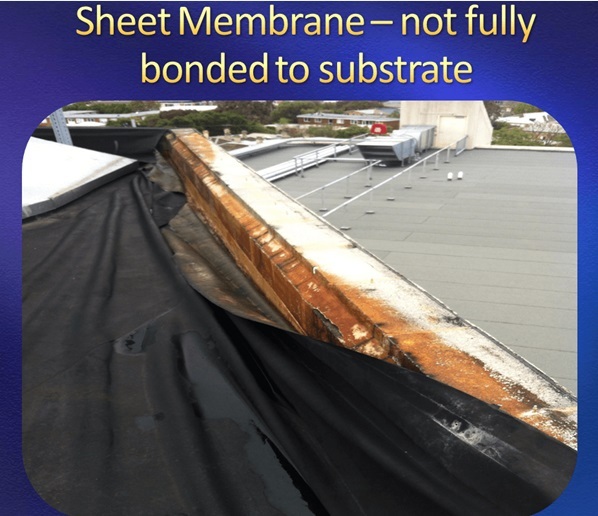 The previous torch-on sheet membrane had completely deteriorated and failed to waterproof and seal the roof surface. The existing roof membrane initially appeared to be in reasonable condition. However on closer inspection, the roof coating demonstrated leaks from all the joints and junctions that were completely delaminated. This was possibly due to continual roof expansion and contraction by heat and cold, with the joins separating and allowed water to move into and track under the sheet membrane. Water was travelling quite some distance from the point of entry which was ingress underneath the sheet membrane. The entire roof was cleaned with high power washing, allowed to dry and then all the plant equipment was masked off. Our Team went to great extent to clean a very old & dirty roof plant deck area! We masked & protected adjacent roof surfaces prior to membrane spray application. Sections of the rooftop deck equipment remained exposed. This ensured that areas of rust would be sealed & coated with the liquid membrane. Preparation of joints and junctions was completed by hand using acrylic sealant prior to the top waterproof coating of Liquid Applied Membranes. 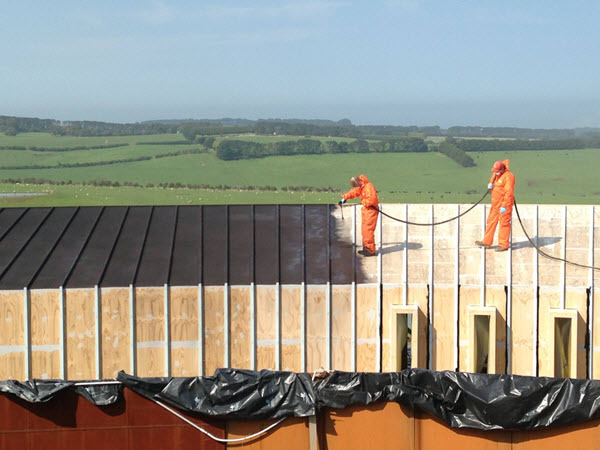 Liquid Rubber was spray applied to the rooftop surface using our special-purpose built mobile spray outfit. The Findlay & Evans mobile Liquid Rubber spray rig was situated on the ground floor. Communication between the spray rig and the applicators up in the rooftop plant area proceeded via radio, headsets and transmitters. 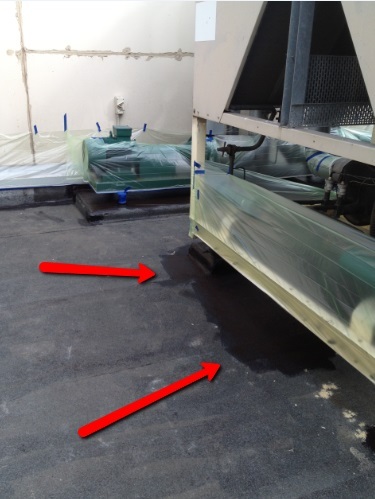 The area underneath the equipment decks required special attention - Liquid Rubber was sprayed through the platform. 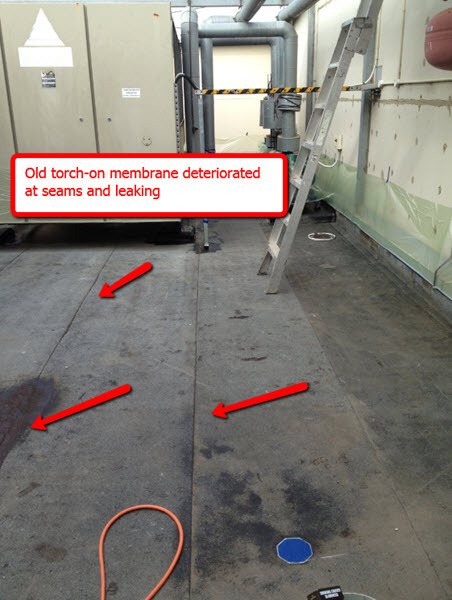 Spraying a waterproofing membrane through and around services ensured rusting equipment was coated & sealed thoroughly. Using spray application negated the need to remove the platform deck sections of the roof. All roof sections, seams, cracks, holes and rough areas were reinforced with the waterproofing Geotextile Bandage. Liquid Applied Membranes will also encapsulate flaking, rusting and peeling metal. Liquid Rubber over-coated the entire roof surface, and also under and around the plant decks and equipment. It should be noted that Liquid Rubber is designed to "hold" water, is UV stable and will not break down, like most conventional membranes often do. 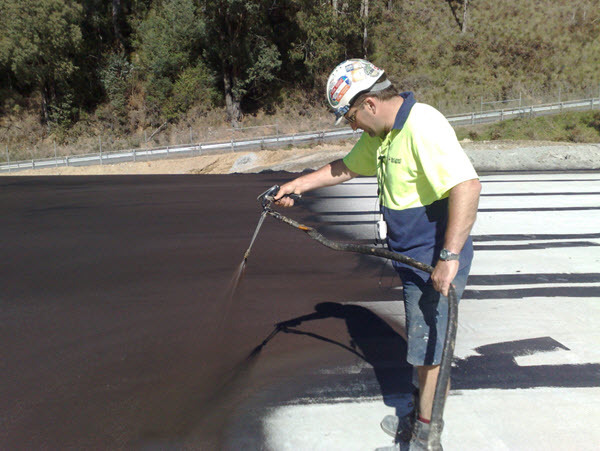 Being spray-applied in one continuous coating means that the Liquid Rubber System is SEAMLESS - no joins or seams. Unlike other waterproofing products, like torch-on and rolled sheet membranes, which have seams. Very often water ingress occurs via cracks in joins or separated seams. 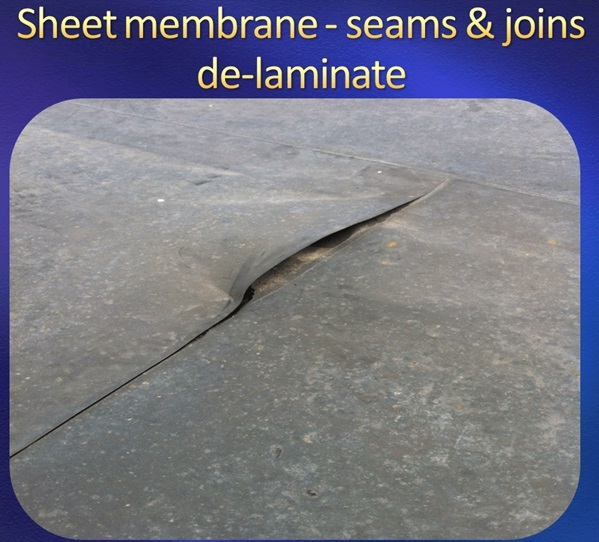 The normal cyclic temperature movement of roof expansion & contraction, ageing and drying out of sheet waterproof coatings can lead to crack and splits in the membrane surface.